The Line Islands, Teraina Islands or Equatorial Islands, is a chain of atolls (with partially or fully enclosed lagoons) and coral islands (with a surrounding reef). Kingman Reef is largely submerged and Filippo Reef is shown on some maps, although its existence is doubted. The islands were formed by volcanic activity and are located in the central Pacific Ocean, south of the Hawaiian Islands. The 11 islands stretch for 2,350 kilometres (1,460 miles) in a northwest–southeast direction, making it one of the longest island chains of the world. 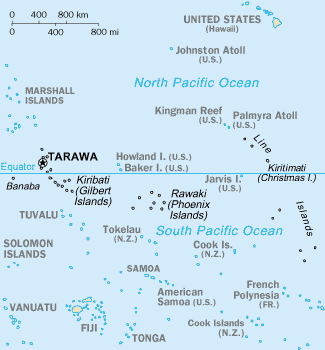 Eight of the islands form part of Kiribati, while the remaining three (Kingman Reef, Palmyra Island and Jarvis Island) are United States territories grouped with the United States Minor Outlying Islands. Only Kiritimati and Tabuaeran atolls and Teraina Island have a permanent population. The International Date Line passes through the Line Islands. 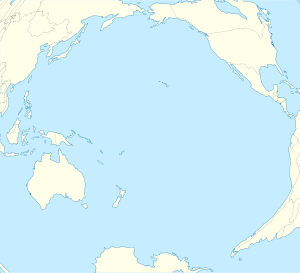 The Line Islands that are part of Kiribati are in the world's farthest forward time zone, UTC+14:00. The time of day is the same as in the U.S. state of Hawaiʻi, but the date is one day ahead. The time is 1 day and 2 hours ahead of some other islands in Oceania like Baker Island, which uses UTC−12:00. Most 18th-century visitors to these isles overlooked the tell-tale signs of former Polynesian settlement. This is true of Captain Cook, who landed on Kiritimati (Christmas Is) in 1777, and Captain Fanning during his visits to Teraina (Washington Is) and Tabuaeran (Fanning Atoll) in 1798. Archaeologists have since identified remains of coral marae platforms and/or village complexes on all three – also on Malden, Millennium Atoll and Flint Island. These remains are dateable as far back as the 14th century, and show that the inhabitants of the Line Islands were more than just castaways. Whaling ships were regular visitors to the islands in the 19th century, in search of water, wood and provisions. The first recorded visit was by the whaler Coquette to Christmas Island (Kiritimati) in 1822. The islands of Fanning and Washington were annexed as part of the British Colony of the Gilbert and Ellice Islands in 1916, followed in 1919 by the similar annexation of Christmas Island. However, these annexations were contested by the government of the United States, citing its Guano Islands Act of 1856, which allowed for very wide-ranging territorial claims. The latter claims persisted until relinquished under the Treaty of Tarawa, which recognised Kiribati's sovereignty over the majority of the Line Islands chain. In the meantime, the Line Islands featured briefly in biennial reports furnished by the Colony's resident commissioner to the Colonial Office and Parliament in London (e.g., see the 1966 and 1967 report). The group is geographically divided into three subgroups; The Northern, Central, and Southern Line Islands. The Central Line Islands are sometimes grouped with the Southern Line Islands. The table below lists the islands from North to South. * The lagoon areas marked with an asterisk are contained within the island areas of the previous column because they are, unlike in the case of a typical atoll, inland waters completely sealed off from the sea. Kiritimati is the largest atoll in the world in terms of land area. The islands were annexed by the UK in 1888 with a view to laying the Pacific cable, with Tabuaeran (then Fanning Island) as a relay station. The cable was laid and was operational between 1902 and 1963 except for a short period in 1914. Copra and "Petfish" are the main export products (with seaweed). Following a 1995 time zone realignment, Caroline Island (red dot at far east of map) became the easternmost land west of the International Date Line. On December 23, 1994, the Republic of Kiribati announced a change of time zone for the Line Islands, to take effect December 31, 1994. This adjustment effectively moved the International Date Line over 1,000 kilometers (620 mi) to the east within Kiribati, placing all of Kiribati on the Asian or western side of the date line, despite the fact that Caroline's longitude of 150 degrees west corresponds to UTC−10 rather than its official time zone of UTC+14. Caroline Island now is at the same time as the Hawaiian Islands (Hawaii-Aleutian Standard Time Zone), but one day ahead. This move made Caroline Island both the easternmost land in the earliest time zone (by some definitions, the easternmost point on Earth), and one of the first points of land which would see sunrise on January 1, 2000 — at 5:43 a.m., as measured by local time. The stated reason for the move was a campaign promise of Kiribati President Teburoro Tito to eliminate the confusion of Kiribati straddling the Date Line and therefore being constantly in two different days. However, Kiribati officials were not reluctant to attempt to capitalize on the nation's new status as owners of the first land to see sunrise in 2000. Other Pacific nations, including Tonga and New Zealand's Chatham Islands, protested the move, objecting that it infringed on their claims to be the first land to see dawn in the year 2000. In 1999, in order to further capitalize upon the massive public interest in celebrations marking the arrival of the year 2000, Caroline Island was officially renamed Millennium Island. Although uninhabited, a special celebration was held on the island, featuring performances by Kiribati native entertainers and attended by Kiribati president Tito. Over 70 Kiribati singers and dancers traveled to Caroline from the capital Tarawa, accompanied by approximately 25 journalists. The celebration, broadcast by satellite worldwide, had an estimated audience of up to one billion viewers. ^ Crowe, Andrew (2018). Pathway of the Birds: The Voyaging Achievements of Māori and their Polynesian Ancestors. Auckland, New Zealand: Bateman. p. 62-64. ISBN 9781869539610. ^ Gilbert and Ellice Islands Colony. (1969). Report for the Years 1966 and 1967. London: Her Majesty’s Stationery Office. ^ a b c d "Australia-Oceania :: United States Pacific Island Wildlife Refuges". CIA - The World Factbook. US CIA. Retrieved 2012-09-16. ^ "22. Teeraina" (PDF). Office of Te Beretitent - Republic of Kiribati Island Report Series. 2012. Retrieved 28 April 2015. ^ a b c d e f g "Kiribati 2005 Census of Population and Housing: Provisional Tables" (PDF). Kiribati National Statistics Office. Retrieved 2012-09-16. ^ "21. Tabuaeran" (PDF). Office of Te Beretitent - Republic of Kiribati Island Report Series. 2012. Retrieved 28 April 2015. ^ "20. Kiritimati" (PDF). Office of Te Beretitent - Republic of Kiribati Island Report Series. 2012. Retrieved 28 April 2015. ^ "CIA - The World Factbook -- Kiribati". The World Factbook. US CIA. Retrieved 2012-09-16. ^ Harris, Aimee (August 1999). "Date Line Politics". Honolulu Magazine. p. 20. Retrieved 2006-06-10. ^ Kristof, Nicholas D. (March 23, 1997). "Tiny Island's Date-Line Jog in Race for Millennium". New York Times. Retrieved 2006-06-10. ^ Letts, Quentin (January 25, 1996). "Pacific braces for millennium storm over matter of degrees". The Times. Retrieved 2006-06-10. ^ a b "2000 greeted with song, dance". Japan Times. Associated Press. January 1, 2000. ^ "Millennium Island greets Y2K warmly". ClimateArk.org. Associated Press. December 30, 1999. Archived from the original on February 13, 2005. Retrieved 2006-06-11.